What is the International Day of Democracy? The International Day of Democracy, observed by all United Nations member states, is a day to celebrate and promote the values, ideologies & importance of democracy worldwide. The day is on the 15th of September every year, and the international community celebrates for democracy. Its history dates back as far as 1988, when the international conferences on new and restored democracies (ICNRD process) began under president Corazon Aquino of the Philippines after the dictator (and Aquino’s predecessor) Ferdinand Marcos was overthrown. The ICNRD process developed into a tripartite structure with governments, parliaments and societies getting involved. The 6th conference (ICNRD-6) held in Doha, Qatar in 2006, concluded a declaration & Plan of Action reaffirming the fundamental principles and values of democracy. So, after the 6th ICNRD, an advisory board set up by the chair of the 6th ICNRD, Qatar, decided to promote an International Day of Democracy. Qatar took the lead in drafting up a UN General Assembly resolution, and on the 8th of November 2007, the resolution titled “Support by the UN system of efforts of Governments to promote and consolidate new or restored democracies” was adopted. 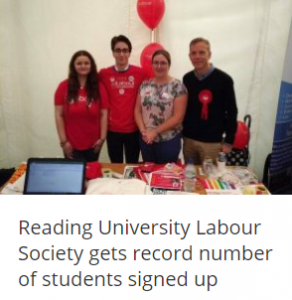 Each year there’s a new theme to engage societies to celebrate! So, how is this day related to politics? Politics is the heart of democracy. Without good politicians and representatives running the country, it could have an impact on the strength and effectiveness of democracy. For this reason, it’s important to use our democratic system to show a standing support for democracy and to use our vote given to us because of democracy. Many argue that the EU referendum process wasn’t very democratic, because media outlets were given lenience on what they could share with the public, even if they were giving the public misinformation or outright lies. If we had regulations provided by parliament which were firmer on the media’s stories, preventing them from giving misinformation without reliable sources, then the process may have been more democratic. Democracy gives us an invaluable say on how we feel about the society we’re a part of and how we believe things could be different … Could you image a UK without democracy? These are just a few examples of life without democracy. Spooky? We agree, very spooky. As a young person, your future is yours to own. Your voice counts, so make it count. The Labour Party was founded by workers for workers, a fresh face for democracy. The party’s view on democracy is clear. 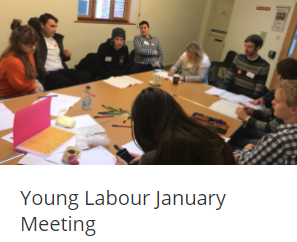 The Labour party has a number of pages on its website emphasising the importance of democracy and even allows members of the public to submit their thoughts and opinions simply. But some of these issues will affect young people more than anyone. The vast majority of young people voted to remain in the EU and, even though we are leaving, we certainly left our mark, with the EU referendum having the largest voter population turnout since the 1997 general election , and estimated largest voter turnout between 18-25 year olds since the 1997 general election, meaning before Brexit, we hadn’t voted so much for the last 20 years. That’s pretty impressive. We let the UK and in extension the rest of the world know! We can do that will every British policy that goes through into parliament, not just the EU referendum. Sounds pretty cool! I think I may vote in the future… How do I do it? 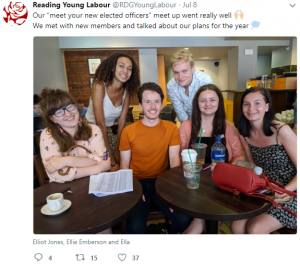 Here at Reading Young Labour we’re very passionate about democracy and boy do we love to be heard! 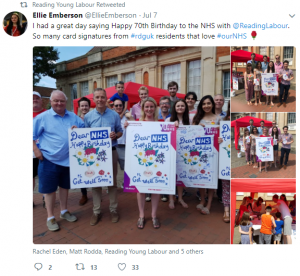 We run events like celebrate 70 years with the NHS, canvassing & campaign training, conference visits and so much more, to get ourselves into the nitty gritty of politics and what’s going on. We love democracy and we use it!